conveyor belt. Is America about to experience conveyor-belt sushi in a big way? Known as kaiten-sushi, a branch of the largest chain, Sakae Sushi, has made the leap to America (“leap” is an appropriate analogy, since the company logo is a frog on a lily pad—although no frog sushi is served). The premiere is the launch of a goal to be, ostensibly, the first successful sushi chain in America. The company, based in Singapore, has 40 sushi restaurants there, and 20 in other countries—none of which offers the market potential of the large and sushi-hungry American public. The high-tech restaurant should also appeal to the experiential dining desires of Americans. There’s a patented interactive menu at each table, enabling patrons to create custom orders, as well as a hot water tap to refill cups of green tea. There is three-tiered pricing—three different colored plates, priced at $1.90, $3.90 and $6.90, depending on the value of the contents. In a bit of architectural irony, the two conveyor-belt restaurant, totaling 97 feet of rolling sushi, sashimi, soups, salads, dumplings, ramen, yakitori and other bites, is located in the venerable Chrysler Building, one of the country’s most dignified architectural landmarks. It’s an easy location for anyone to get to, right across the street from Grand Central Terminal, at 42nd Street and Lexington Avenue. Taking the train into town? 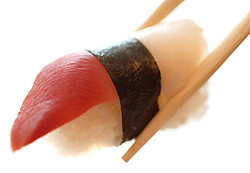 Drop in for some sushi before heading to your destination. The speed with which consumers can get their sushi from the conveyor belt gives new meaning to the term “fast food.”The chain was established in Singapore in 1997 with the goal of offering affordable Japanese food. In New York City, which is not known for conveyor-belt restaurants, it will certainly be the king of kaiten. The restaurant, located at 405 Lexington Avenue at 42nd Street, is open 7 days for breakfast, lunch and dinner, from 7 a.m. to midnight. A 24-hour delivery service will be offered. For more information, visit Sakae-Sushi.com or telephone 1.877.SAKAE-USA. You don’t need the luck of the Irish to enjoy Leprechaun Bombs from Cosmic Chocolate. You just have to read THE NIBBLE (or else, live in Oakland, California and wander into this boutique chocolate shop). Part of the shop’s “Cosmic Bomb” series, these bonbons are the bomb: beautifully hand-painted chocolate shells, dappled with edible glitter. The Leprechaun Bombs are filled with a ganache that is infused with Bailey’s mint liqueur, Irish whiskey and Green Chartreuse, an ancient herb liqueur of more than 130 medicinal and aromatic herbs, flowers and other plants (who can even name that many?). Taken from an old alchemical recipe for an “elixir of life,” it was first made in the 1600s by monks of the Grande Chartreuse monastery in the Chartreuse Mountains of eastern France, intended as a medicine. You don’t have to be Irish to deserve a set or two of Leprechaun Bombs from the Cosmic Chocolate Shop. The recipe was enhanced and became popular as a beverage. It’s green in color, hence appropriate to the Leprechaun Bombs. A second Chartreuse liqueur, colored with saffron and milder and sweeter than the original, is called Yellow Chartreuse. The yellow color with the greenish tinge known as chartreuse takes its name from the Yellow Chartreuse liqueur. But back to the chocolate. 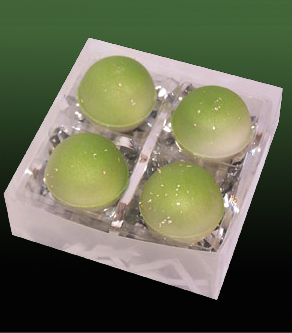 You can purchase four bonbons for $8.00 in a transparent box, allowing the cosmic glow of the Emerald Isle to shine through (well, not really—but the candy looks great) at CosmicChocolateShop.com—and you can see the other Cosmic Bombs as well. We haven’t tasted the Leprechaun Bombs, but we’ve enjoyed every other Cosmic Bomb that has crossed our lips, so our money is on the Leprechauns. When you order, please tell the Cosmic Chocolate folks that it’s St. Paddy, not St. Patty (you’ll note that error in their website description). No one likes his name spelled wrong, not even the patron saint of Ireland. When your name gets spelled like a girl’s name, even a saint has his limits. – See our other favorite St. Patrick’s Day chocolate, candy, cookies and more. 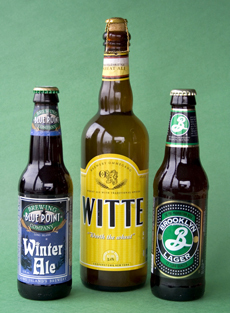 A trio of craft beers from New York State that “competed” in our Super Bowl beer tasting (New York versus New England). This Bud’s not for you, if you’re one of the millions of Americans with a finer palate for craft beer, represented by the bottles at the right—all of which are proudly brewed in our home state of New York. (Brooklyn Brewery, which has quite a few exciting brews—of which the lager shown is the everyday basic—is one of our favorites.) The craft beer market again grew by double digits in 2007, leading all other segments in the beer category. The Brewers Association reports that estimated sales by independent craft brewers were up 16% in dollars (12% percent in volume). While craft brewers’ share of the total beer category is just 5.9% of sales and 3.8% of volume, In 2007, the U.S. had 1,449 total breweries in operation, of which 1,406 comprise small, independent, and traditional craft brewers. The other 43 are industry giants— Anheuser-Busch (Budweiser, Miller), Molson Coors, Pabst (also owns Schlitz) and regional brewers like Ballantine of New Jersey, Rheingold of New York, Stroh of Michigan, Stroud of Pennsylvania and Narraganset of Rhode Island. Since 2004, dollar sales by craft brewers have more than doubled: they’ve increased by 58%, according to the Brewers Association. This correlates with the trend of buying local products, plus a preference for higher-quality, more flavorful specialty foods and beers. While craft brew quaffers are very familiar with labels like Anchor Steam, Brooklyn Brewery, Goose Island, Harpoon and others carried by stores that can carry upwards of 100 craft brands, nearly 70% of craft breweries are brewpubs that make and sell most or all of their beer on-premises. Read more about beer in the Beer Section of THE NIBBLE online magazine. A cinnamon stick for garnish is optional. 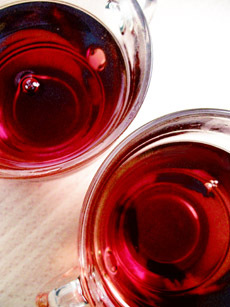 The word “mull,” referring to sweetening, spicing and heating of wine or ale, has been traced back to 1610 or so. Wine and ale often went bad; by adding spices and honey (sugar was not widely available for another two centuries), it could be made drinkable again. Almost every European country has its version of mulled wine (even the French make vin chaud), and it is popular in South America as well—today as a comforting drink, not to cover up bad booze. The spicy-sweet aroma of the mulling wine will fill your home—it’s the beverage equivalent of baking cookies. You can buy premixed mulling spices in a specialty food store or spice shop (or even in some supermarkets); or you can measure out a little allspice, some dried orange rind (a.k.a. orange peel) and a few whole cloves into a muslin pouch or spice ball (add peppercorns if you’re into pepper, and star anise if you have it), and throw a few cinnamon sticks into the brew. Historical note: The holiday wassail bowl of yore was a mulled ale, flavored with cinnamon, ginger and nutmeg, topped with slices of toast (think croutons). The wassail served at today’s Medieval holiday reenactments is likely to be mulled cider, to accommodate modern palates. Find more drink recipes for entertaining in the Cocktails Section of THE NIBBLE online magazine. Learn about peanut butter, and maybe you’ll win these chocolate peanut butter chip cookies from Solomon’s Gourmet Cookies. Are you nuts for peanut butter? 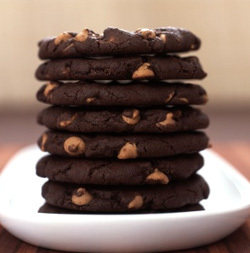 Or do you simply love chocolate chip cookies? Take the Peanut Butter Trivia Quiz in THE NIBBLE’s Gourmet Giveaway this week, and you may win a prize of two dozen luscious peanut butter chocolate chip cookies from Solomon’s Gourmet Cookies (we reviewed these cookies last year and ate every last crumb—they’re also kosher-certified). Just answer four fun trivia questions about peanut butter—you don’t even have to answer them correctly. Everyone who enters has an equal chance of winning. Take the quiz, from March 3rd through March 9th for the prize, or anytime for fun. You’ll learn great factoids and will be able to impress your friends that you know where it was invented, by whom, and why. Learn more about peanut butter in the Jam, Jelly & Peanut Butter Section of THE NIBBLE online magazine.